Honduras, probably Ulua Valley, Late Classic, ca. A.D. 550-950. 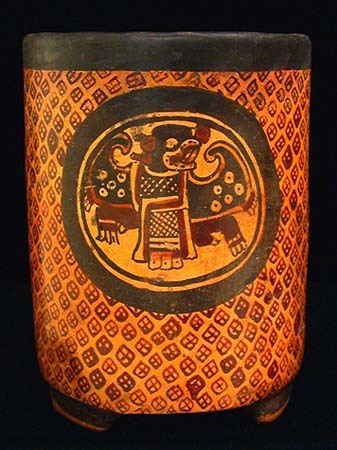 This polychrome cylinder, standing on three feet, is painted in dark and light orange against a black rim and three circles enclosing effigies of elaborately painted bats with jaguar heads. The field is decorated with rows of diamonds enclosing cross-hatching. This is a very dramatic work of art. Provenance: From a Santa Barbara, California collection formed during the 1960s-'70s.